Beautiful two bedroom apartment, great location in Palermo Viejo, adjacent to a variety of coffee-shops, restaurants and bars. 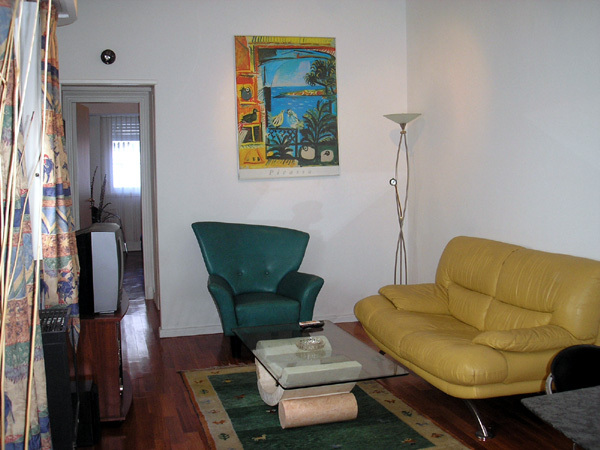 This apartment has the advantage of being very quiet yet still only 2 minutes walk from the charming plaza Guadalupe. It is exquisitely decorated and it offers all the comforts you need for your stay to be perfect. There is a living-dining room with air conditioner, both bedrooms have a double bed with air conditioners (the second bedroom can be adapted to suit needs). The kitchen is very nice, modern and fully equipped. The bathroom is complete with bathtub and shower. Bright, quiet, nicely and modern furnished, hardwood floor, 3 AC, heating, cable TV, Hi Fi System, High Speed Internet, kitchen equipped with refrigerator, freezer, toaster, microwave, coffe-maker, dishes, kitchenware, washing machine. Towels and sheets. Included: Electricity, gas, water, cable TV, building and city taxes. Not Included: Internet and cleaning service .